I certainly misinterpreted something I saw at Baum Lake. Throughout the spring I have been watching the pelicans at the lake in the hope of seeing some chicks or nesting adults. When I saw these pelicans with their dark grey heads I assumed that they were juveniles moulting out. I was disappointed to not see the chicks, but happy to see juveniles. Well. . . after laying eggs and while they are caring for chicks, the adults undergo a supplemental moult resulting in grey on the crown and nape. The juveniles also have grey on the head, but also on the coverts. In addition, the adults have orange legs and bills while on the juveniles those are yellow. These pelicans are not juveniles but adults with eggs or chicks. The search for American White Pelican (Pelecanus erythorhynchos) chicks or juveniles continues. 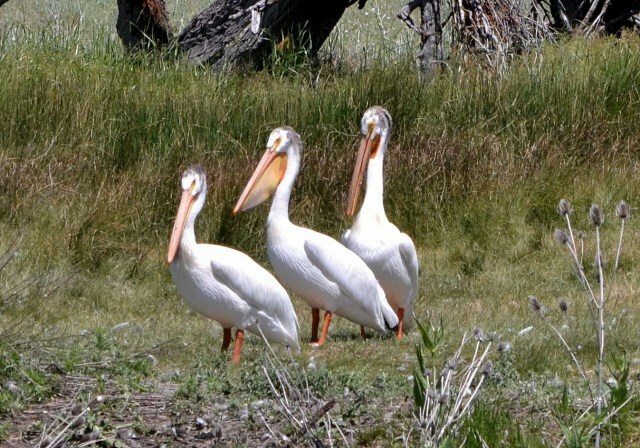 This entry was posted in Birds and tagged American White Pelican, nature photography, Pelecanus erythrorhynchos. Bookmark the permalink.